SID Paid in Full! Elevated above the homes below with almost panoramic views of the southern Virgin Mountains, and Flat Top Mesa! 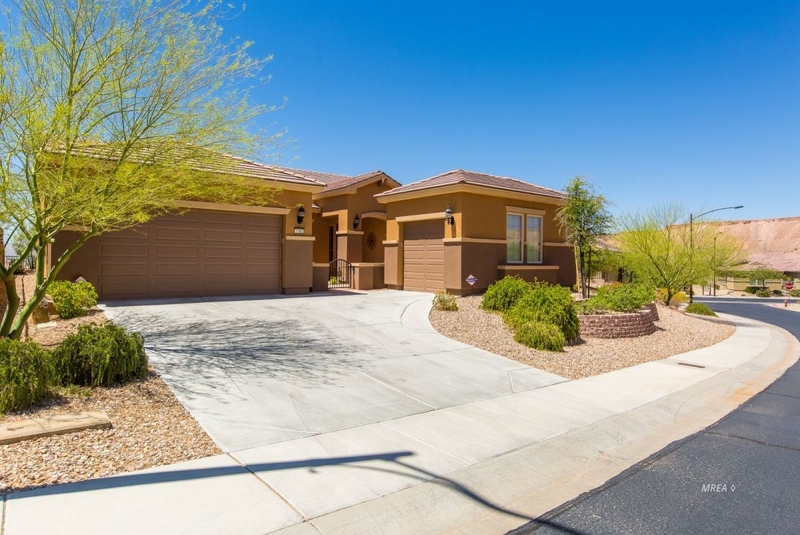 This beautiful Verbena features a gated entry courtyard, 3 bedrooms + spacious den with double glass doors, 2 Full Baths (bath 2 has a door into bedroom 2), 2-car gar + detached 3rd car, separate dining room and breakfast nook, indoor laundry room w/utility sink. Newly remodeled kitchen features brand new Santa Cecelia granite - the breakfast bar countertop was lowered from the high top to all-on-one-level with more usable counter space, which is a more popular feature and makes this home unique to other Verbena plans on the market. There is no carpet in this home! The carpet in the bedrooms and closets was replaced with wood laminate, cleaner and easier to maintain. The rest of the home has beautiful 18" x 18" tile laid on the diagonal thru-out, which gives the home a more spacious look. Recently re-painted exterior. Experience resort-style living at Sun City Mesquite by Del Webb! Fun activities & trips, indoor and outdoor pools, spas, fitness facility, golf course, restaurant, 18 hole putting course, tennis, pickleball, bocce and much more!